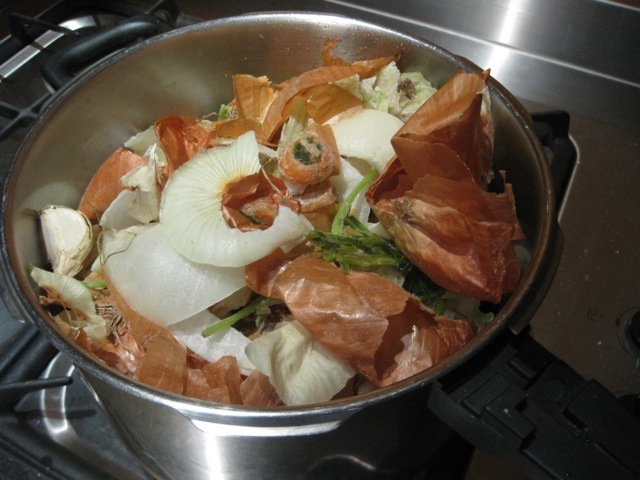 If home cooks reconsidered what should go into the pot, and what into the trash, what would they find? What new flavors might emerge, what old techniques? Pre-industrial cooks, for whom thrift was a necessity as well as a virtue, once knew many ways to put the entire garden to work. Fried green tomatoes and pickled watermelon rind are examples of dishes that preserved a bumper crop before rot set in. “Some people these days are so unfamiliar with vegetables in their natural state, they don’t even know that a broccoli stalk is just as edible as the florets,” said Julia Wylie, an organic farmer in Watsonville, Calif. The article also offers suggestions on how to use various stems and leaves. Though an expert interviewed in the article claims people roll their eyes at the idea of saving scraps for stock, that is something I do myself. My method is pretty simple. When prepping food I make a little scrap pile at the corner of my cutting board. Certain items normally go in compost, like fruit peels and brown or rotting food. Tomato stems, lettuce ends, herb stems, onion skins, carrot tops, mushroom ends, and anything else that would add flavor and nutrients go into a gallon bag I keep in the freezer. I avoid cabbage, broccoli, and beets due to flavor/color. When the container gets full, I pile everything into my pressure cooker with a bunch of water and boil to make a couple of liters at least of vegetable stock. Without a pressure cooker it just cooks a little longer, say 30-45 minutes. I tend not to season it so that it works better in any recipe. Strain and save in bottles or jars (screw cap wine bottles are ideal for this) for use in soups, grains, wherever stock is called for. I now have some new ideas for what to do with organic citrus skins though! See also an earlier post about uses for organic banana skins. All these ideas seem to me very Great Depression/WWII era, which I love to explore– but I wonder who else bothers or otherwise rolls their eyes? Love to hear your comments. This entry was posted in Produce and tagged homemade vegetable stock, sustainable, using scraps. Bookmark the permalink. I do the exact same thing to make vegetable stock! It makes the most well-rounded, flavorful stock because it’s usually comprised of so many different vegetables from the several weeks of collecting scraps.